I’m a huge fan of the city’s efforts to get a total of 100 miles of protected bike lanes (which put a physical barrier between cyclists and moving traffic) and buffered bike lanes (conventional bike lanes with extra dead space striped on either side) by 2015. Protected lanes are crucial if we’re going to significantly boost Chicago’s bike mode share because they attract the so-called “interested but concerned” demographic, folks who would like to try urban cycling but are worried about getting hit by cars. The Chicago Department of Transportation (CDOT) deserves major kudos for installing 11.4 miles of protected and 18.65 miles of buffered lanes in the last two years. That said, there are some issues with Chicago-style protected lanes, created by moving the parking lane to the left of the bike lane, which is delineated by flexible plastic posts, so that the parked cars serve as the barrier. For example, this configuration makes it harder for right-turning drivers to see cyclists, which can result in the dreaded “right hook” crash. It’s common for motor vehicles, especially cabs and delivery trucks, to drive and park in protected lanes. And curbside asphalt tends to be in worse shape than the rest of the road and often has poor drainage, as demonstrated by the slush-filled puddles in the Dearborn Street protected lanes this winter. European-style raised bicycle lanes, elevated a few inches above street level and sometimes located an inch or two below the sidewalk, could solve all of these problems. 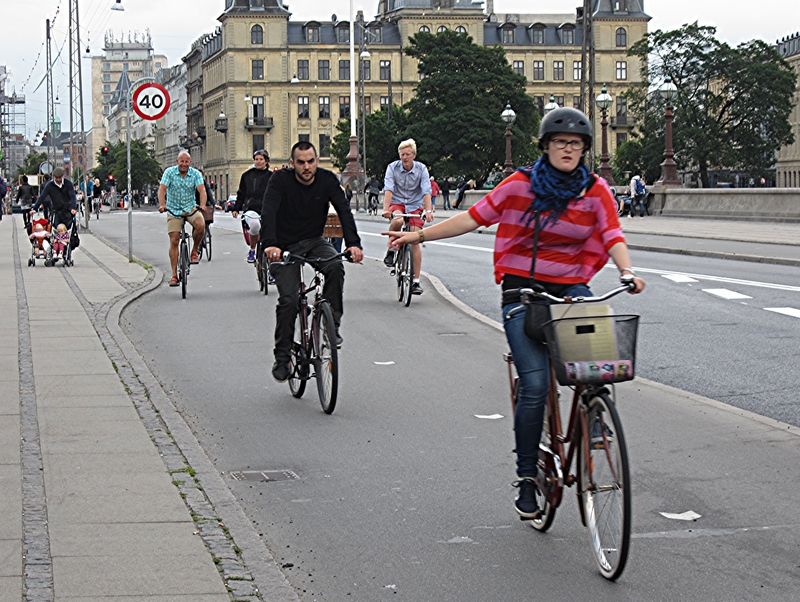 Also called grade-separated lanes, these facilities are the norm in cities like Amsterdam and Copenhagen, which each have more than seventeen times our bike mode share. Chicago’s Bike 2015 Plan, published in 2006, called for testing grade-separated lanes in two or three locations by 2010, but nothing ever came of this recommendation. CDOT Commissioner Gabe Klein explains that grade-separate lanes cost roughly $1 million per mile to build, about four times as much as Chicago-style protected lanes. Construction would be much more complicated, and getting approval from federal and state authorities plus local aldermen would be more challenging. But Klein rode on raised lanes during a visit to the Netherlands last October, and he agrees that they would be a big improvement over Chicago’s current lanes. Klein surprised me by revealing that CDOT actually plans to install Chicago’s first raised bike lane within the next year. He declines to say which streets his department is considering because they’re still in negotiations with the Illinois Department of Transportation and other agencies. But he says the potential locations are on streets that already have high levels of cycling, where he’s confident the local aldermen will get behind the plan and there won’t be a major backlash from residents. Milwaukee Avenue, more or less, fits that description, and CDOT plans to build protected bike lanes on that street this spring between Elston Avenue and Kinzie Street. But Klein says it’s much cheaper to install raised bike lanes on roadways that are undergoing a full-depth reconstruction, which involves resetting utility lines and drainage, since building the lanes requires moving the curb and gutter. Milwaukee is not scheduled for this kind of reconstruction, but we can expect to see Chicago’s first raised lane built on another popular biking street that is. “In the future, if we’re reconstructing, and it makes sense, and we can work it out with the authorities, we’d like to see grade-separated bike lanes become the standard,” he says.